Stephen Maguire admitted he could not cope with the bizarre antics of Dechawat Poomjaeng as the world number 70 and 500-1 title long shot caused a stunning upset on his debut at the Betfair World Championship. At the age of 34, Sheffield-based Thai potter Poomjaeng is older than most newcomers to the Crucible but in professional snooker terms he is a near novice. He only joined the main tour last season after years of plugging away in Asia, and Maguire suggested he had not got to grips with the etiquette of the sport after losing 10-9 in the first round to a player the crowds took an instant liking to. Poomjaeng laughed, smiled and gurned his way through the match, playing some bizarre but often brilliant shots, applauding them on at least two occasions, and repeatedly holding his hand up in apology at the slightest lucky break. When he spilt water by his seat as the match neared its dramatic conclusion, it was too much for world number five Maguire. When asked for his take on that incident, Maguire said: "Who knows? I was afraid to look at him in the end. "Crazy things were happening out there. I just had to switch off. "I don't think he's the full shilling. I've never seen him before but there's definitely something missing. "He seems like a really nice boy and very genuine. "The crowd seemed to take to him and got behind him at the end and he seemed to be enjoying it." 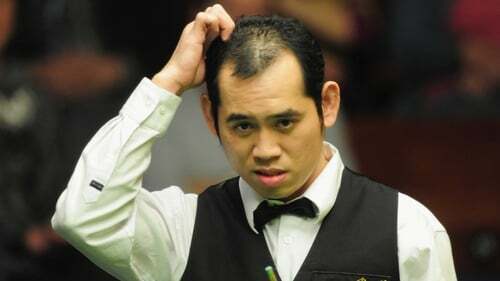 Poomjaeng was as amazed as anyone that he had beaten a player who reached the semi-finals last year. "It's a big surprise because Maguire is a top-five player and I thought I only had a 10 or 20 per cent chance of beating him," said the former world amateur champion. At the very beginning of the match, Poomjaeng got lost backstage and fluffed his walkout, before finding the entrance to the arena and striding to the wrong table. "I go to Thailand and I can't remember my way around, and it was just like that," he said. Poomjaeng will face Michael White of Wales in the second round, meaning there will be a debutant in the quarter-finals. Ali Carter will take on Ronnie O'Sullivan in the last 16, seeking revenge for defeat in last year's final. Carter last night sealed a 10-4 victory over debutant Ben Woollaston and initially fended off questions about O'Sullivan. With O'Sullivan returning from almost a full year away from the tour, Carter may never have a better chance to beat the four-time world champion, and eventually he acknowledged that. "I think I'd rather be playing him in the second round than the final, definitely," the 33-year-old Chelmsford cueman said. "Arguably, it's probably a good time to play him." Judd Trump was resuming this morning with a 6-3 lead over Dominic Dale, after an opening session in which he made a break of 142, the highest so far in the tournament. Ding Junhui was also returning this morning, possessing a 7-2 advantage over Scottish veteran Alan McManus. Hong Kong's Marco Fu carried a 6-3 cushion into the concluding session of his clash with Welsh hope Matthew Stevens, while world number one Mark Selby led by the same margin against Matthew Selt. Australian Neil Robertson, strongly fancied to win a second world title this year, was beginning his challenge against Robert Milkins this afternoon.